I don't care if it's spring and sweet potato season is technically long over (being, as it is, in November and December). I am constantly seduced by them. Their paper bag skins hiding a sudden burst of orange. (Is it the sweet potato that's orange, or is that the yam? I know there are definitive answers to this question, and I've tried to remember, but frankly, at the end of the day, it doesn't much matter to me.) Why is it that the normal potato (normal in every sense of the word: white interior, wall-flower flavor, the silent bystander to everyone else's party) gets so much more play? I like to make the sweet potato perform the roles normally reserved for its quiet counterpart: twice baked, simply roasted, in soups, and here, in a potato salad. I hope I don't have to convince you of the sweet potato's many virtues. Lord knows I have to convince R, who roundly refuses to try anything that's so much as been in contact with my beloved little root. Something to do with too many sweet potatoes eaten in New Zealand, as though too many sweet potatoes were a possibility. All that really amounts to is a bowl filled with sweet potato that's been drenched in a healthy honey mustard dressing, which I don't have to share. As with all potato salads, it's important to dress your vegetables while they're still hot so they fully absorb the flavors. I've eaten this chilled, straight out of the bowl in which it was refrigerated, as well as closer to room temperature. Both are very good. Enjoy! Spray a baking sheet with cooking spray and spread the sweet potato cubes out in one layer. Bake the potatoes for 30 minutes, until tender. The time may vary according to the heat of your oven and the size of your potato chunks. 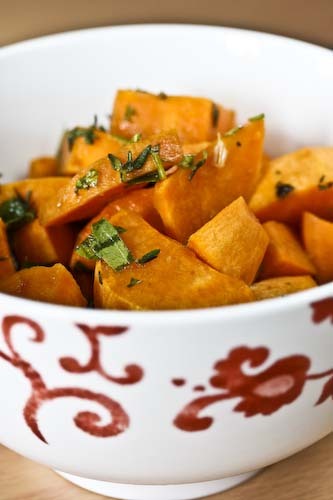 Mix all of the other ingredients together, then toss with the still warm sweet potatoes. Refrigerate for 1 hour until chilled, then serve. I'll eat sweet potatoes regardless of the season! This looks like a great one to try. I eat sweet potatoes pretty much everyday, so this will be a great change up to my routine. Thanks Andrea! Sweet potatoes are always great. I love Chinese french fries which also made from sweet potatoes. Perfect! I've been eating v. unhealthfully lately, and this will get me back on track. Love sweet potatoes! Perfect. Nice click. Love the bowl. Looks lovely! 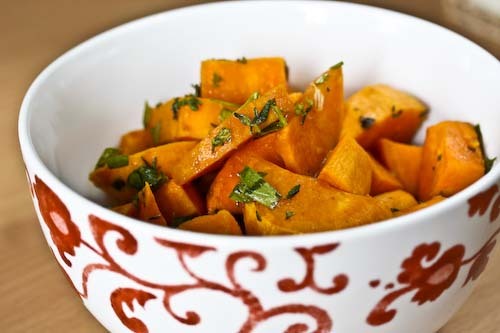 I LOVE sweet potatos, so healthy and tasty, yum! I had a similar salad at a very fancy deli near my old office and fell in love at first bite. 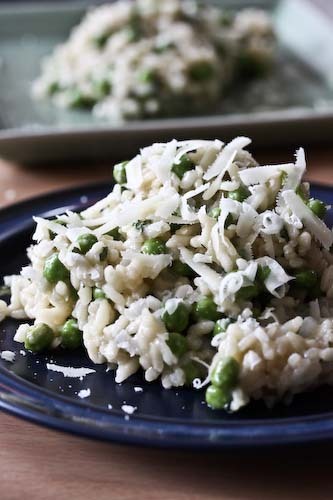 I've been searching for a recipe to make it myself and yours looks pretty darn close!! I eat sweet potatoes year round. So good for you - and I never get tired of them! I love the colour of sweet potatoes, they're so bright! I like to make baked potato wedges with them flavoured with a little smoked paprika. How is it that I've never thought of sweet potato salad? Sounds fabulous!